Pakistani President Pervez Musharraf has sworn in Yusuf Raza Gillani as the prime minister, leading a coalition government opposed to him. Key leaders of the coalition kept away from the ceremony in Islamabad, in what BBC correspondent Barbara Plett says is an apparent snub to Mr Musharraf. Mr Gillani is a leader of the Pakistan People's Party (PPP) that won the most votes in elections in February. Two top US officials have meanwhile arrived for talks in Pakistan. US Deputy Secretary of State John Negroponte and Assistant Secretary of State Richard Boucher held talks with Nawaz Sharif, who heads the PPP's coalition partner, the Pakistan Muslim League-Nawaz (PML-N). Officials say they are also expected to meet President Pervez Musharraf and Mr Gillani. The US has said it expects Pakistan's new government to continue a crackdown on Islamist militants along the country's border with Afghanistan. President Musharraf has been a key ally in the US-led "war on terror". Leaders in the new coalition have hinted at a negotiated solution to the Islamist uprising. Speaking after the meeting, Mr Sharif said he had told the US envoys it was "no longer a one-man show in Pakistan" - referring to President Musharraf. He said the country would adopt a new strategy against terrorism after the matter had been debated in parliament. "It is unacceptable that while giving peace to the world we make our own country a killing field," Mr Sharif said. Pakistani analyst and former general Talat Masood told AFP news agency the US envoys were "fearful of any softening towards the militants by the incoming government". Zaffar Abbas, an editor with Pakistani newspaper Dawn, said the arrival of the US delegation on the day the new prime minister had been sworn in suggested they were "trying to dictate terms". "The problem with the Americans is they don't understand the domestic pressure on the new government," Mr Abbas told the Associated Press news agency. "People are expecting this government to explore other possibilities for a solution to what's happening in the tribal areas," he said. Mr Musharraf administered the oath of office to Mr Gillani in a short, crisp ceremony at the presidential residence in Islamabad. The Pakistani national anthem was sung, along with verses from the Koran. The BBC's Barbara Plett says the ceremony caps 24-hour period that has highlighted the president's increasing isolation. Mr Gillani's first move after being elected by parliament on Monday was to order the release of top judges detained when President Musharraf imposed emergency rule in November. The judges were dismissed as they were about to decide on the legality of the president's re-election last year. The PPP nominated Mr Gillani as its candidate at the weekend. This is the first time in 12 years that the PPP will head the government, a coalition with a substantial majority. 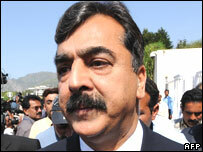 Correspondents say Mr Gillani is much admired within the PPP. He has resisted pressure from President Musharraf to desert the party, refusing to do any deals with him. 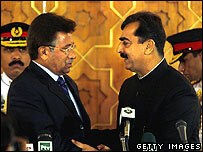 Mr Gillani was sent to jail in 2001, serving five years following a conviction over illegal government appointments. The sentence was passed by an anti-corruption court formed by President Musharraf. His opponents say it was a means of intimidating and coercing their members to join his government.